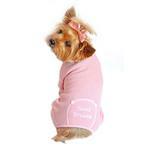 Help your dog have a great night's rest with these Pink Sweet Dreams Embroidered Dog Pajamas by Doggie Design! Dogs will stay warm this season as they go to dreamland. These comfortable dog pajamas feature a super soft 70% Cotton, 25% Polyester, 5% Spandex blend. This dog PJ has a fantastic stretch which makes it very comfortable to wear and easy to put on. Does your dog suffer from allergies or skin conditions? The full coverage of these dog PJs offers a great solution for dogs prone to itching, scratching and biting. Give your pet with skin conditions a chance to heal with this cute and functional garment. Care: 70% cotton, 25% polyester, 5% Spandex. Hand wash, line dry. Sweet Dreams Embroidered Dog Pajamas by Doggie Design - Pink Customer Photos - Send us your photo! Chloe luvs all of her clothes from BaxterBoo! When it gets colder outside, she can't wait to put on her jammies and get nice and warm and cozy! These pajamas by Doggie Design are the best fitting cutest PJ’s! Rosie stays warm and looks cute in hers! Rosie is my first pup and I love her to pieces! She wears sleepers from BaxterBoo to stay warm. Rosie stays warm and looks cute in her pink thermal sleeper from BaxterBoo! The cool thing about this sleeper is the leg size is adjustable. Rosie stays warm and looks cute in her pink thermal sleeper from BaxterBoo! LOTUS is AMAZING! she is the best in your arms and knows when you had a bad day. She uses her big brown eyes to look deep into your soul. she LOVES to chase leaves outside, and licks your face when she is excited to see you. She is such a good mate to Bamboo and a GREAT mother to Violet. She looks sooooo good in her new PJs. Lotus is AMAZING. she melts in your arms and has eyes that look right through you into your soul. she LOVES food of any kind and will do anything to get it, she loves having raspberries blown on her and she licks your face when she gets excited to see you. She wants nothing more to be held and rocked to sleep! My little Maisie wearing Sweet Dreams Embroidered Dog Pajamas, at 11 weeks old. Size Small fits perfectly, is lovely quality, soft & comfortable. She looks so cute in her pink pajamas. This is lil Chloe's real lil sister Sophie, she also has these beautiful pink pj's and loves them.. (U have Chloe's pic up on your site too) .. <3 So cold here and the girls love their pjs..
Lexie and Riley are two of our 4 babies, the love each other and their pj's from Baxterboo!! My three month old Maltipoo loves her Jammie's......I can see she is going to be a little diva! Zoey in her "Sweet Dreams Pjs"After a long day 4wheeling. Penelope is a rescue we have had her now 3yrs. She loves to dress up in Baxter Boo clothes. Her she is in her new winter one pc long johns. This is Raven in her adorable PJ's from BaxterBoo. She loves them and looks so cute & comfy in them. Posted On 10/20/18 by Teedonna from Greenville, SC Yes, Teedonna recommends this product! There was a big difference between the small and extra small. My pet is a 4 1/2 lbs slender Chihuahua measurements - neck 8", widest part of the chest completely around 12 3/4" length from back of neck to beginning of the tail bone 11". I originally received the small in pink but had to return it for the extra small which fits snugly yet perfect. I liked it so much I ordered another extra small in blue. I will wash this in cold water and hang it since there is no room for shrinkage since it fits so perfectly. Posted On 12/25/17 by Jesus M R from San Angelo, TX Yes, Jesus M R recommends this product! Posted On 11/26/17 by Tina M from Brookings, OR Yes, Tina M recommends this product! I own probably six of these PJ's in different colors for my two Morkies and and my Yorkie and absolutely love them. They wear well, wash well and fit perfectly. Posted On 11/09/17 by Tracy P from owingsville, KY Yes, Tracy P recommends this product! These thermal underwear type jammies fit my Chinese crested SO well and they cover well- she loves them! They are very well made-I highly recommend!!!!! I love these and so do Bella & Tucker. They are lightweight but keep them warm on the cool evenings. And my babies look adorable in them! Posted On 10/26/17 by Janice Johnson from Vallejo , CA Yes, Janice Johnson recommends this product! These pj’s are so cute but beware - they run small. My dog is 10 lbs and I thought the small would be her size but the medium is perfect. Quality is great. Posted On 10/25/17 by Sue S from Raleigh, NC Yes, Sue S recommends this product! These pajamas are absolutely the cutest ever!!! They are very soft and there is plenty of stretch in them so that your pet doesn't feel restricted in them. They are a light-weight thermal, which is what I wanted. I did have to order a larger size than I thought. Thanks to the Live Chat with BaxterBoo I was able to get the correct size. I have a 12-pound Schnoodle and she took the size large. Cutest, cutest thing ever!!! Posted On 06/12/17 by Rena P from Dayton , TX Yes, Rena P recommends this product! Posted On 06/09/17 by Diane H from SAN TAN VALLEY, AZ Yes, Diane H recommends this product! OMGsh these are the cutest little jammies ever. My daughter with fur looks so precious. Thank you for having the best outfits anywhere. Posted On 03/09/17 by carol m from victoria cda. bc, Yes, carol m recommends this product! sweet dreams and sweet deal! Posted On 03/05/17 by Veronica S from Mastic Beach, NY Yes, Veronica S recommends this product! Cute, adorable and stretchy cotton pj's. They are great because you can cuff the legs up. I ordered the large for my Maltese who just recovered from an illness so she lost some weight. She was 8.8lbs prior + had a spa day so they're a little big but will keep them for when she returns to her normal weight. Posted On 12/15/16 by Joyce R from Dumfries, VA Yes, Joyce R recommends this product! I have bought all my dogs clothes at Baxter Boo, however these are the first things I am not thrilled about. The material is just a bit lighter than I expected, I got these to keep her warm on these cold winter nights, but she gets her legs out of them. I am hoping to use them once it snows to keep the ice balls off her legs. It may work. Posted On 11/28/16 by RIta I from Chalfont, PA Yes, RIta I recommends this product! Posted On 11/17/16 by Haley Garelli from Hauppauge, NY Yes, Haley Garelli recommends this product! love my baby's new pj's she looks so cute and loves wearing them !???????? Posted On 11/11/16 by SUSAN T from , MA Yes, SUSAN T recommends this product! Posted On 10/27/16 by Renee P from Orange, VA Yes, Renee P recommends this product! My baby looks so precious in these! Great quality! So adorable! Both of my girls looks adorable in their new Sweet Dreams pajamas. Posted On 10/02/16 by Ann Marie T from Holyoke, MA Yes, Ann Marie T recommends this product! I bought these for my little Maltese Gabi and they are absolutely adorable. The PJ's are well made, good quality material (very soft) and washes well. Posted On 08/17/16 by Janet D from , NJ Yes, Janet D recommends this product! Posted On 12/08/15 by Diane T from Menifee, CA Yes, Diane T recommends this product! I really love the pjs. I just rescued a Pekingese mix and she is so cute. I have bought so many clothes from you that I decided to get some for her. I now am the proud mother of two females puppies. I love them and their company. Posted On 11/12/15 by Shree C from Holly Lake Ranch, TX Yes, Shree C recommends this product! Absolutely stinkin' cute. LOVE IT!!! Posted On 10/28/15 by Jennifer W from , NC Yes, Jennifer W recommends this product! My Yorkie looks PRECIOUS in this!! Perfect for the cold Winter Nights! She sleeps (and looks) like an angel in her new pj's!!! Posted On 10/11/15 by Karen F from Eden prairie, MN Yes, Karen F recommends this product! Love these PJs. They are perfect and so adorable. Thanks Baxter for having such a varied collection of dog clothes. Posted On 10/09/15 by Karen F from Eden prairie, MN Yes, Karen F recommends this product! Love these pajamas. Bought the holiday ones also. Some pajamas my dog walks out of the back legs, not these. They stay put. Posted On 09/23/15 by Julie L from York, PA Yes, Julie L recommends this product! Lexie looks awesome in her new pjs! Not too heavy not too thin! Love my puppy's pj's. Just like the old Longjohn's I remember from my youth. Made so well and cute as can be. Posted On 01/07/15 by Cheryl M from , FL Yes, Cheryl M recommends this product! The material is so soft! This looks adorable on and she loves it! It also works great for layering clothes when it's cold out!! Just love it! Posted On 12/16/14 by Michele f from Roseland, VA Yes, Michele f recommends this product! very cute and light weight to wear to bed. Posted On 11/04/14 by Monika V from , CA Yes, Monika V recommends this product! True to size. And my pup feels warm and cozy in it. So pup "said" it's a lovely pj. Posted On 10/27/14 by sue g from avis, Yes, sue g recommends this product! Posted On 10/20/14 by Mary Beth C from , Yes, Mary Beth C recommends this product! My little Lily looks so adorable in these and they keep her toasty warm while she sleeps! Well worth the money! Posted On 10/09/14 by Sandy B from Palm Coast, FL Yes, Sandy B recommends this product! Wish you could see my Little Gidget in these cute Pajama's. We live in Florida and are planning a trip to the Blue Ridge Mountains where it is much cooler than she is use to. She will enjoy them even more on her Vacation. Posted On 10/08/14 by Patricia D from jacksonville, FL Yes, Patricia D recommends this product! These PJ's are adorable, soft and very easy to put on. Easy slip on style makes getting ready for bed a snap. The fit is perfect, as with all the BaxterBoo products that I have purchased. Very good quality with every purchase. Very nice apparel to choose from and very good buys and no hassle returning items.